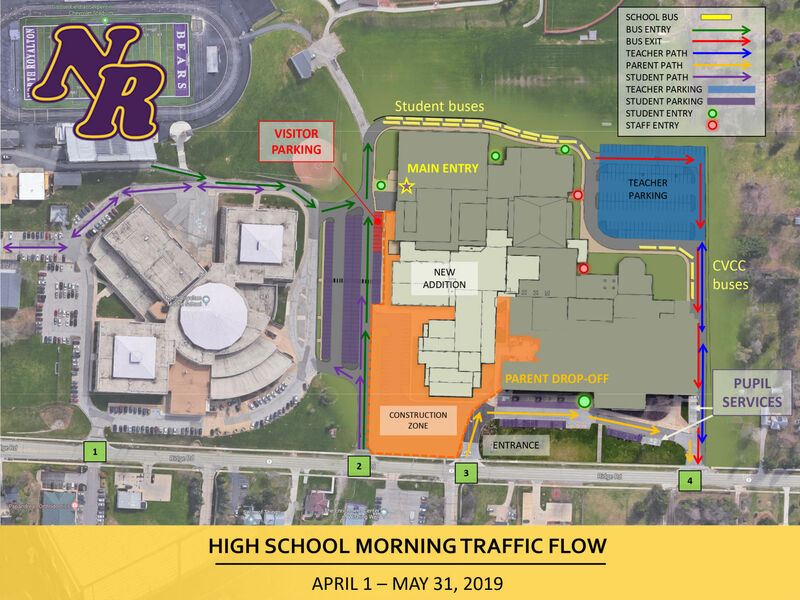 NORTH ROYALTON – With the transformation formally beginning at the high school, morphing it into a construction site that changes traffic and parking patterns as of April 1, the school district is urging parents of middle and high school students to have them ride the school bus to minimize congestion. On March 22, crews were expected to begin re-configuring the parking lot between the middle and high schools and installing construction fencing around the work site in preparation of phase one, which is construction of the new two-story addition that will house an auxiliary gymnasium, science labs and mathematics classrooms. The new addition will open for the 2020-2021 school year. Because the high school will formally be a work site when students return from spring break, the more middle and high school students that ride the bus the better, officials say, to keep vehicle traffic at a minimum for the safety of students and efficiency of construction crews. Bus route information is available at www.northroyaltonsd.org/Transportation.aspx. With the construction site now being sectioned off, excitement is building and the project is becoming more real, officials said. A formal groundbreaking ceremony is planned for 11 a.m. April 6 at the high school and the community is welcomed. “This is going to be an exciting time in our district. I am looking forward to celebrating at the groundbreaking ceremony on April 6,” Superintendent Greg Gurka said. Because the main entry to the high school will be blocked off, visitors to the building should note that the new entrance to the high school will be the north side of the Performing Arts Center close to the softball field. What was once the student parking lot will now be the addition’s work zone, so students have five locations they can park, with a permit only, the remainder of the school year – Lot A which is the large main parking area closest to the building main entry and the marked parking spaces in front of the community room, Lot B between the board office and Country Stove Patio and Spa, the practice soccer field, Memorial Park and the City Green. Over the summer the entire back parking lot on the east side of the high school will be removed and replaced. New underground utilities, light poles and sidewalks will also be installed. The new lot will improve traffic flow for the revised bus routes and offer some additional parking spaces. As for traffic patterns, they will change at the high school and remain as they are for the middle school. At the middle school, parent drop-off and pick-up before and after school will enter off Ridge Road at Driveway 1. At the high school, parent drop-off and pick-up before and after school will enter off Ridge Road at Driveway 3. Driveway 2 will be for parents who are picking their student up during the day. 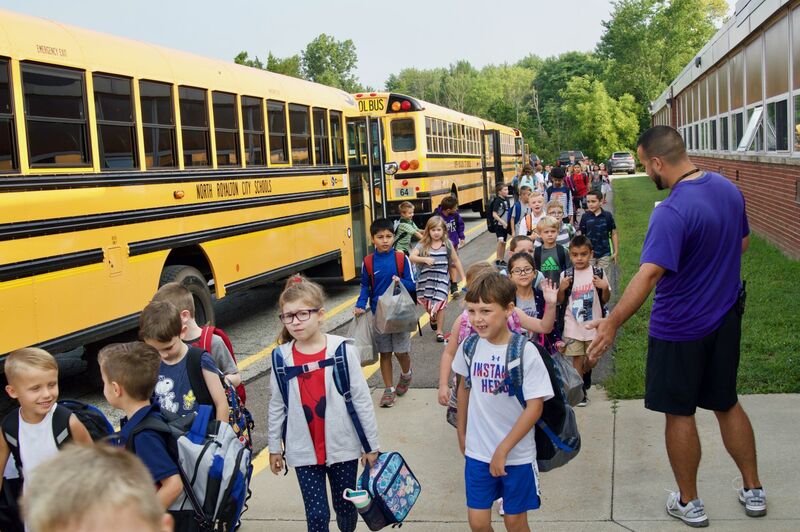 If students need to be picked up during school hours, it must be done before 1:45 p.m.
Those picking up students after school will not be permitted to enter the campus until 2:35 p.m. as there will no longer be anywhere on the property for cars to wait. Aside from the addition, phased renovations will be performed in the existing high school building and are being executed in a way to minimize impact to students and their learning environments. The final phase is the demolition of the front façade of the high school along Ridge and installation of the final parking lots, sidewalks and driveways. Work is expected to be completed by December 2021. The school district is mailing every middle school and high school family a pamphlet explaining these changes in greater detail. Info is also available on the district website at northroyaltonsd.org.